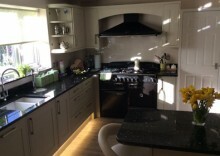 We are your friendly "LOCAL" kitchen / bedroom experts, with all of our team working and living in Hertfordshire & Essex (not 5 hours away up North or down south!). With over 40 years experience in project designs, manufacturing and real customer satisfaction with the very latest products and materials. We work very differently to many other company's, we DO NOT insist you and your partner must be present for a 4 hour survey! And then push for an order. We do encourage everyone to come into our showroom to see the displays and hundreds of sample doors, but if you prefer we are very happy to bring a few samples of your choice to your home. We give you peace of mind by explaining how everything can be modified or redesigned with your choice of - new made to measure doors, side panels, kick plinths, cornice & pelmets and correct choice of handles. And we can plan in new extra made to measure colour matched units with new soft close drawers and hinges. 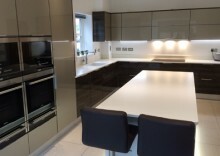 Worktops can also be changed for a wide choice of colours and materials, from high quality LAMINATES to SOLID WOOD, QUARTZ, GRANITE OR SOLID COMPOSITES. New sinks, taps and appliances can also be replaced from a huge selection of brands that we offer. By having TRANSFORM survey and check all details and dimensions for your new look kitchen, you can be sure every new product will fit perfectly! That's why TRANSFORM ARE A "WHICH" TRUSTED TRADER. There is really no need to rip out your whole kitchen. TRANSFORM can save you time, save you money and save you mess, by having new replacement doors and Worktops fitted in just a day or two! SAVE TIME - SAVE MESS - SAVE MONEY! 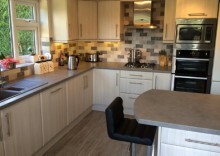 Transform have 40 years of experience and expertise, so can quickly and effectively restyle and revamp your kitchen without the mess and hassle of your kitchen being a building site for 2 or more weeks! WHY RIP OUT YOUR WHOLE KITCHEN? When you already have a good plan layout and the CARCASE UNITS are perfectly ok, there is really no need to rip it all out, let Transform give it a complete new look and up to date function. Because Transform survey, measure and prepare all of your new doors, side panels, plinths and new Worktops to correct size and ready to fit to your existing cabinets, and with the expertise of our installers your kitchen will be completely transformed in just a day or two! Transform offer you the complete service and peace of mind that you are in the hands of experts, right from the first initial survey with professional advice on styles and colours, through to confirmed on time delivery, careful dismantle and removal of all of your old doors and Worktops, then complete expert fitting of all of your new kitchen products. The average kitchen that consists of 12 doors and 5 drawer fronts, together with new cornice, pelmets, plinths new hinges and handles , plus laminate Worktops all completely fully installed - from only £2,500. 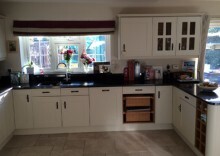 COMPLETE NEW LOOK WITHOUT STRUCTURALLY CHANGING YOUR KITCHEN! 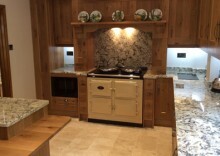 Transform can make and install any part to as much or little as you require, to change the look and update your kitchen without the need to change the structure of your kitchen by keeping the CARCASE cabinets in place. We then replace all the components that are seen, thus giving your kitchen a completely up to date new look and new working lease of life! 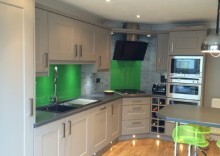 TRANSFORM REVAMP - HALF THE PRICE OF A FULL KITCHEN! When you really consider the massive upheaval and expense of having a complete fully fitted kitchen, which would involve a complete full room rip out, new plumbing and electrics, re- plastering and re- tiling, effectively making your room into a building site for weeks! 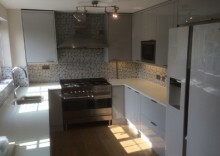 Then adding on the cost of the complete new kitchen, Worktops and appliances plus all, of the labour costs, it all easily adds up to more than two or three times more than having Transform revamp your existing kitchen. And without all of the mess and inconvenience to you!